From Amsterdam to Arequipa to Auckland, from Anchorage to Albuquerque to Austin to Amherst, from one end of the country and the planet to the other, the worldwide cannabis nation took to the streets Saturday for the 2011 Global Marijuana March. At the same time, in Mexico, marchers trekked from Cuernavaca to Mexico City, and gathered in other Mexican cities as well, to plead for an end to the drug war violence that has killed more than 37,000 people in the past four years. Events were scheduled in some 262 cities around the world. They ranged from handfuls or dozens of people in small American and Canadian towns and remote global outposts, to hundreds or thousands in larger cities around the planet. A few places saw even more. In Toronto, tens of thousands of people came out for the Freedom Fest. 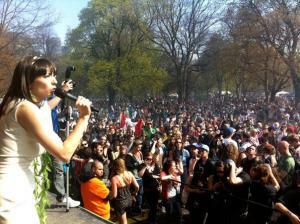 A haze of pot smoke hung over Queens Park as revelers were treated to an afternoon of bands and speakers, including Jodie Emery, wife of imprisoned Prince of Pot Marc Emery. The Toronto march may have been this year's largest. An estimated 25,000 people marched in cities across Argentina, including at least 1,000 in Rosario and 15,000 in the capital, Buenos Aires. Marchers there demanded that the government move further down the path of decriminalization and harm reduction. 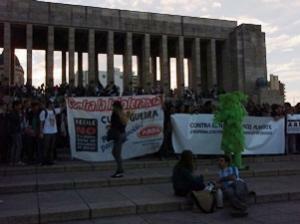 "The march in Rosario was great," said Silvia Inchaurraga of the Argentine Harm Reduction Association (ARDA). "In the first march we organized here in 2002, there were only a handful of people, and now we have more than 1,000," she told the Chronicle. "We don't need more speeches from politicians, even progressive speeches, we need a new drug law and a new drug policy. Despite the Supreme Court rulings of 2009 [decriminalizing marijuana possession], the old drug law is still in effect and drug users are still arrested and punished, and harm reduction is not the official policy of the National Secretary on Drugs." In Jakarta, Indonesia, the number of marchers may have been small, but their audacity was great, and their action sparked preemptive warnings from police and Reefer Madness-style denunciations from people who should know better. Police first warned that the march was illegal, but then announced they would only arrest people breaking the drug laws. The day before the march National Narcotics Agency spokesman Gen. Indradi Thanos said the group behind the march should "stop their campaign to legalize marijuana because the substance was defined as an illegal addictive drug in the narcotics law." Indradi added somewhat ominously that the agency would hold talks with the network activists to determine if there were "vested interests" backing them," according to the Jakarta Post. But on Saturday, the Nusantara Marijuana Network (LGN) led some 50 or so people on a march to the Tugu Tani monument in central Jakarta. Unlike Western marchers, most were dressed uniformly in white t-shirts with green ribbons. But like Western marches, posters of Bob Marley bedecked a pick-up truck leading the parade. "As a first step, we call on the government to provide objective information about marijuana," LGN chair Dhira Narayana said. "People need to be informed that marijuana can be used to cure cancer. Marijuana is also no more addictive than coffee or tea," he added. One self-described non-smoker, Soraya Cassandra of the network's education team, hit the hemp angle. "There is a lot of biased information about marijuana and this is the reason why much of the public does not understand the substance," she said. "The cannabis plant can be used to produce paper. This will save a lot of trees because the cannabis plant can be harvested three times a year," she added. The Jakarta march certainly sparked a reaction. The Indonesian Child Protection Commission announced it rejected pot legalization because it could have negative effects on children. "Children's brains will be damaged, as will their future, commission head Arist Merdeka Sirait told Tempo. The National Narcotics Agency and University of Indonesia psychiatrist Dadang Hawari also rejected legalization. Dadang told Tempo that marijuana leaves don't kill, but have ill effects on the brain, including long-term mental and behavioral disorders. Marijuana was appropriately categorized as a narcotic, Dadang claimed. And also reacting was former Vice President Jusuf Kalla. "We cannot legalize marijuana because at certain doses it is unbelievably dangerous to health," he told the Jakarta Post. The work of cannabis education has clearly only just begun in Indonesia, but at least it has begun. In Mexico City, where the work of cannabis education has been underway for some time, thanks to groups like the Mexican Association for Cannabis Studies, hundreds gathered Saturday downtown to demand decriminalization. They chanted and cheered for musical actors and speakers, including the association's Leopoldo Rivera. "We consider it prudent to be informed on this topic. People who consume are not necessarily criminals or ill, it could be any regular person who is a productive, contributing member of society," Rivera said. But in Mexico, it wasn't just about freeing the weed -- even at the Global Marijuana March. "We are lobbying for the decriminalization of marijuana as a way to reach peace. Currently, the number of dead in Mexico is 40,000, and it is due in big part to drug trafficking," said environmentalist Arnold Ricarde. That the horrid violence of the Mexican drug war is overshadowing other drug reform issues there was made clear the next day, as more than 100,000 turned out in Mexico City to greet the hundreds of marchers who had set out from Cuernavaca, 60 miles to the south, on Thursday to demand "no more deaths, no more hate, no more blood." Led by poet and essayist Javier Sicilia, whose son and six others were found murdered in Cuernavaca in late March, presumably at the hands of the Pacifico Sur cartel, by the time the march arrived at the Zocalo, Mexico's City's gigantic central plaza, it had morphed into a mass of humanity crying out for an end to endless cycle of violence. "We don't want any more death because of this growing mess," said Sicilia, from a platform in Zocalo... "No more deaths, no more hate. We've come out to walk these streets with dignity and peace... violence will only bring us more violence," he added. A manifesto for the march called for the government to solve the killings and disappearances, address social ills, fight corruption, impunity, and money-laundering, and drop its "war strategy" in favor of a focus on citizen safety. Sicilia's crusade has brought a sharp focus to the growing disenchantment with President Felipe Calderon's decision to take the battle to the cartels in December 2006. Despite the deployment of some 45,000 federal troops, the violence has not diminished, but intensified. The government has to change its strategy, the protestors said. "We've had it with this terrible government that goes unpunished. We want peace," said Araceli Vazquez, 60, as he held up an improvised placard with his demands. On Monday, President Calderon offered to meet with protest leaders, a clear sign that their voice is being heard. But he was not backing away from his insistence on a military solution to the cartel problem. "We can agree to disagree," he said. The somber multitudes of Mexico City are a world away from the happy tokers of Toronto, but whether it is marijuana legalization or ending the drug war paradigm that has produced the murderous Mexican madness, drug prohibition is the underlying cause that unites them. 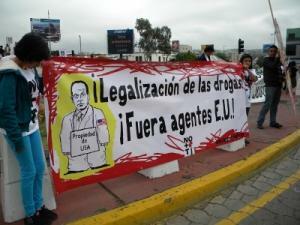 "But in Mexico, it wasn't just about freeing the weed -- even at the Global Marijuana March." Democracy and Other things we lost due to the "War on Drugs"
While violent protests rage around the world and dictators murder there own citizens, we here in America sit quietly while our Federal Government, Federal Prosecutors and The Drug Enforcement Administration turn hard working, tax paying and other wise law abiding Americans into Convicted Felons. What should a society do when it's elected officials refuse to listen to the voice of the people ? Who will make the first move in the fight to regain that which has been stolen from us ? When will the American people stand up and demand that the Rights we all took for granted be restored as written in the United States Constitution and the U S Bill of Rights ? While the registered voters of one state after another go to the polls and vote to legalize the Use of Medical Marijuana, the Federal Government, the D E A and even the U S Supreme Court Justices continue to persecute, arrest, prosecute and convict American Citizens who in all actuality are protected under a bill passed in the 1970's, The Americans with Disability Act, this Federal law states that any American who suffers from a disability can not be discriminated against by anyone. When the single act that set's the United States apart from any Dictatorship in the world is negated by a Government who's agenda is about absolute authority, we must protest but when that Government dismantles the Democratic process of the vote by the people for the people, we must fight back. The War on Drugs has dismantled The United States Constitution and we must follow the lead that our oppressed brothers and sisters have set at what ever cost. In a Democracy the will of the people is Law and our elected officials are only custodians but when the elected officials that make up the governing body for the people profess to know what is best for it's citizens despite the truth, then we no longer live in a Democracy because we have been overthrown by a Dictatorship and like our forefathers we must be willing to spill our own blood.